If you have been in search of a simple, effective and understandable way to achieve your self-realization through meditation, you can stop looking. 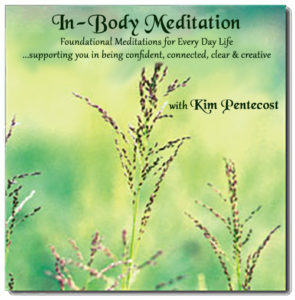 This CD combines Kim’s know-how and patience with her very soothing voice to guide you step by step in using the meditative tools she provides for you. Her method is the solution to anyone who has been stymied by trying to learn meditation the hard way. You can choose to listen to all of the meditations or bring up the one you need. I use the grounding every day and I don’t know what I would do without it! The grounding is especially helpful when I am sitting down to write and having trouble focusing. The introduction to the chakras is a very comfortable introduction and certainly the most user-friendly meditation for them I have found. It doesn’t hurt that Kim’s voice and music are as comforting as a security blanket. This CD shares a method of guided meditation that is used by thousands of people in many places all over the world. Meditation has proven to be successful in helping to integrate one Spirit in one body, one mind and one heart. This allows us to be truly conscious and have the ability to successfully and joyfully live our lives to our fullest potential. These meditations can help you be more creative, more grounded, live more abundantly and feel safer in the world. These meditative tools are simple, effective, powerful and easily integrated into your daily routine. You may use the meditations individually or together. I invite you to listen to them, work with them, play with them and allow them to help you expand your life experience. Also available in downloadable MP3 format.